Sign Up Now for Fall Classes at STARS! Music! Dance! Theatre! Visual Arts! Yoga! They'll all be happening this fall at STARS and you can be a part of it! Registration is now open for fall classes at Soo Theatre Arts Resource Studios (STARS.) Interested students should register in person at the STARS office, weekdays 10 a.m. to 6 p.m. Brochures listing class times and tuition fees are available at STARS or at online at www.sootheatre.org. Class offerings in dance include Movement & Dance, Pre-Ballet, Ballet I, Ballet II, Ballet/Jazz III, Ballet/Jazz IV, Pre-Pointe and Pointe, Beginning Ballet/Jazz A-B, Beginning Ballet/Jazz C-D, Tap I and II, Jazz I, Adult Tap, and Ballroom I and II. All dance classes will be taught by Dianna George. Dottie Case will offer Speech and Dramatic Arts for grades 3-6. Acting for teens and Acting for adults will be taught by David Rhinard. Karen Hughes will be teaching Tunes for Toddlers for preschool children with parent, Elementary Music class, Young Singer Performance Class, Middle School Chorus, and High School/Adult Performance Class. Vocal Techniques for the Church Singer and Arts Appreciation for Homeschoolers will be offered by Ronda McGreevy. Private lessons will be available in violin, viola, cello, flute, clarinet, recorder, voice, harp, and piano. Nancy Powers will also offer Suzuki violin instruction for students ages 3 and older. Individual and group lessons with parent involvement are a part of the Suzuki program. For more information on any of these classes, lessons, and workshops, contact the STARS office, 534 Ashmun St., Sault Ste. Marie, MI, 906-632-1930, or email: stars@lighthouse.net. 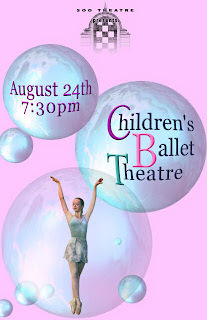 The Soo Theatre Project announces that the Summer Performance Company of the Children's Ballet Theatre of Michigan, directed by Gregory M. George, will perform at the Soo Theatre. The performance will be Friday, August 24 at 7:30 p.m. at the Soo Theatre, 534 Ashmun St, in Sault Ste. Marie, Michigan. Tickets are $10 for adults, $5 for children 8 and under, and FREE for STARS students when accompanied by a paid adult. Tickets are available at the Soo Theatre box office (906-632-1930). Annie: This Weekend Only! Don't Miss It! The cast sings "Tomorrow" during the curtain call of Thursday night's performance of the Soo Theatre's production of Annie at the Soo Theatre. The Soo Theatre's triumphant production of Annie continues Friday and Saturday nights (August 10 and 11) at 7:30 p.m. and Sunday afternoon (August 12) at 3:00 p.m. Get more details and ticket information. More photos from Thursday night's performance. 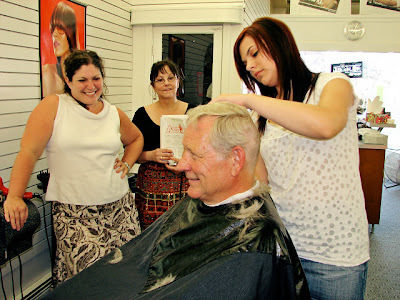 Dave Rhinard (Oliver Warbucks) gets his head shaved by Clarissa Carroll at A Cut Above the Rest as Karen Hughes (Grace Ferrell) and Dianna George (Miss Hannigan) look on—all for the Soo Theatre production Annie, which opens at 7:30 p.m. August 9. Hairspray may be a box office hit at the movie theaters, but hairspray is not needed at the Soo Theatre—at least not for Dave Rhinard. 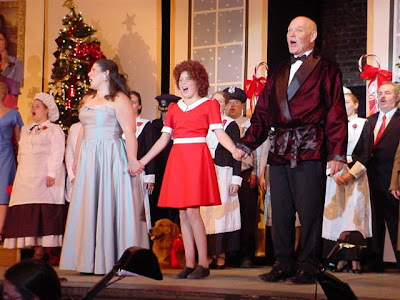 Playing the role of Oliver “Daddy” Warbucks in the Soo Theatre's production of Annie, Rhinard agreed to do more that just let his acting prowess shine—he's allowing his well-shaped head to shine too. That's right, the classic character of Warbucks sports the no-hair look and so does Rhinard now. The Greater Sault Area is in for a treat as the curtains open for Annie. Show times are August 9-11 at 7:30 p.m. and August 12 at 3:00 p.m. Tickets are available at the Soo Theatre office or by phone (906-632-1930): $20 for reserved seating, $15 general admission, and a $5 discount is available for children 8 and under. Everyone's favorite irrepressible orphan shines on the main stage at the Soo Theatre's production of Annie. In addition to the wholesome yet pugnacious Annie, the Broadway hit comes alive with a cast of sixty-four supporting characters, plus a canine. The musical is set in a Depression-ravaged Hooverville and an opulent 5th Avenue, both in New York City. Annie lives in an orphanage operated by the cruel Miss Hannigan. During a daring escape from the orphanage, Annie befriends Sandy, who becomes her loyal canine companion. Meanwhile, multigazillionaire Oliver Warbucks launches a campaign to improve his image by inviting an orphan to spend one week at his mansion. As fate would have it, Annie is chosen to be the lucky orphan. Through her charm, Annie wins over the hearts of the mansion's servants and even begins to breakdown the tough exterior of Oliver Warbucks. Alas, life is never that easy, and Annie and Oliver Warbucks are thrown into a crazy escapade that requires help from the FDR, the President of the United States. Annie is a timeless tale that will thrill audiences of all ages. The musical numbers will have you humming, while the characters melt your heart. 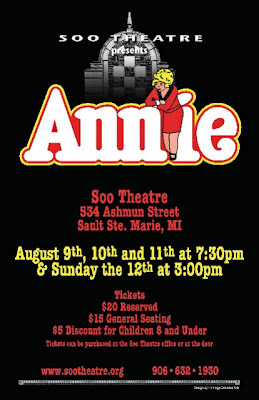 Annie will be featured on the big stage at the Soo Theatre from August 9th through the 12th. Tickets are only $20 for reserved seating and $15 for general admission, and may be picked up at the Soo Theatre office or at the door.